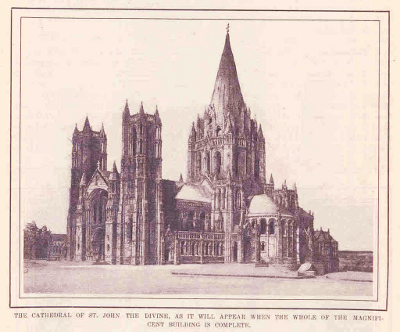 Bishop Horatio Potter founds the Cathedral by obtaining a charter from the New York State Legislature and thereby establishing The Cathedral Church of St. John the Divine as a legal entity. The Panic of 1873 and subsequent economic depression thwart plans to raise funds to acquire a site and commence construction. Horatio Potter dies and is succeeded by his nephew, Henry Codman Potter, 7th Bishop of New York. As one of his first official acts, the bishop issues an appeal to the citizens of New York seeking support for the construction of a cathedral that would be "worthy of a great city," in the Episcopal tradition but broadly ecumenical. A 13-acre site is acquired for the Cathedral atop the plateau known as Morningside Heights. Other leading institutions soon join the Cathedral on the Heights, beginning with Columbia University, Teacher's College and St. Luke's Hospital, creating an "American Acropolis." Sixty-eight architects submit designs in a competition to select a design for the Cathedral. The design competition is won by George Heins and Christopher Grant LaFarge. The Heins & LaFarge design is eclectic - a Romanesque interior with Byzantine overtones and an exterior with many Gothic elements. Bishop Potter lays the cornerstone on the patronal feast, St. John's Day, December 27. Excavation begins for the foundation of the apse. Geological surprises make reaching bedrock a much longer and more costly process than anticipated. The first services are held in a chapel in the crypt, the only part of the Cathedral to be completed after more than five years of work. The Cathedral School is founded as a residential choir school for boy choristers. The eight massive granite columns to support the Cathedral's east end are transported from a quarry in Maine and hoisted into place. Work begins on the massive arches of the Crossing. The roof for the Great Choir is completed. Bishop Potter dies and is succeeded by David Greer, 8th Bishop of New York.